You can sometimes get a better price or upgrade your hotel accommodations at the airport by using Priceline and similar "name your price" bidding services. Most travelers staying at an airport hotel are just there for one night. Either their flight was delayed or cancelled, or they have an early morning flight and don't want to commute from the city center in the middle of the night. 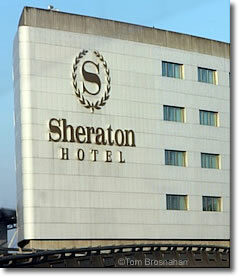 Major airports always have several budget hotels because many travelers want just the basics. They may just be spending 8 hours there. All they need is bed and bathroom. These travelers make reservations at budget hotels, which do a good business. But major airport also have some deluxe hotels to serve those travelers looking for more comfort and facilities, or attending a meeting or conference in the hotel, or staying several days. The budget hotels often fill easily with the many travelers wanting only the basics, but the deluxe hotels are different: if there's no major meeting or other function, filling all of the deluxe rooms can be a challenge. Each room night is a chance for revenue. A room that goes vacant for the night is a chance for revenue...lost forever. So hotels with vacant rooms—even deluxe hotels—will lower their room prices so they can earn at least some money for the room. A famous-name 4-star hotel doesn't want to broadcast the fact that it is willing to discount the price of a deluxe room from 400€ to 120€, so if it foresees that it will have empty rooms, the hotel offers these rooms for sale through "secret" channels. These include "name your price" websites such as Priceline.com. By selling the rooms this way, the hotel can hide the fact that it is discounting until after the customer has made a reservation. Do budget hotels discount the prices of empty rooms? Perhaps, but it happens less because (a) most travelers staying for one night at an airport reserve budget hotel rooms, so there are fewer vacancies, and (b) budget rooms are already low-priced and closer to cost. Budget hotels don't have as much "wiggle room" to lower prices as do deluxe hotels which have much higher prices to start with. At many hotels, including many budget hotels, you can make a reservation and cancel it later with no penalty. If you cancel within the cancellation period (often as short as 24 hours prior to arrival), there may be no cost. So you can make a reservation weeks in advance at a budget or moderate-priced hotel and then, when you're getting close to the end of your cancellation time, try "naming your price" on Priceline.com for a better-quality hotel. If demand is not extreme, you may be surprised: you may find a deluxe hotel room for the price of a discounted moderate or even a budget hotel room! I reserved a room at an Ibis Budget Hotel at Charles de Gaulle Airport a month in advance just so I'd be sure to have a place to stay. Several days before I was to arrive at Charles de Gaulle Airport, I made a bid on a deluxe hotel room—about 50% more than what I would pay for the budget room. My bid was approved, and I spent the night at one of the best deluxe hotels at the airport for a price only slightly more than for the budget hotel I had first considered. be staying here for the price of a much less comfortable hotel?